We know how busy our clients are all year round, and sometimes when a budget is finally signed off, it can often be a time of last minute decisions, and the feeling of ‘help it’s Christmas’ comes swiftly to mind! Why not let Prop Dead Gorgeous come to the rescue? Prop hire, theming and event styling are what we do, and with ‘party ready’ festive packages raring to go at affordable prices, it’s not too late to theme out your venue and end 2016 with a boom! Want something bespoke? Then why not use our ‘in house’ scenic painters and sculptors to create something truly special at often the cost of a normal prop hire. Just send us a drawing, photo, back of a crisp packet sketch even, and we will bring your vision to life! It’s really that easy. Don’t forget the finishing touches either – it’s all about the detail. In fact here at PDG, we are so ‘into the detail’ we have won numerous awards for our beautiful sets and Purple Apple Awards for our retail installations. 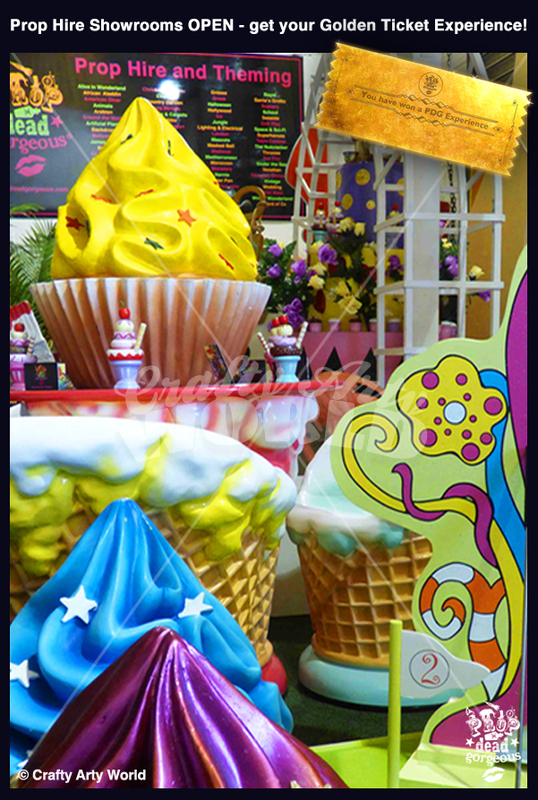 Prop Dead Gorgeous offers a huge selection of props to hire, including life size models, artificial foliage, furniture, backdrops, showsets, costumes and grottos as well as custom made items for promotions, retail displays and brand activations! So we were delighted when the RNLI contacted us to provide bespoke props for their ‘Respect the Water’ drowning prevention campaign this Summer. Around 190 people die in British and Irish waters each year and the RNLI is aiming to see that number halved in the near future. In fact, half those who die at the coast never initially intend to even get wet – a sobering thought. Prop Dead Gorgeous was delighted to provide a stunning Giant Talking Tree for the ‘Bloom and Grow’ horticultural feast at Canary Wharf this month. 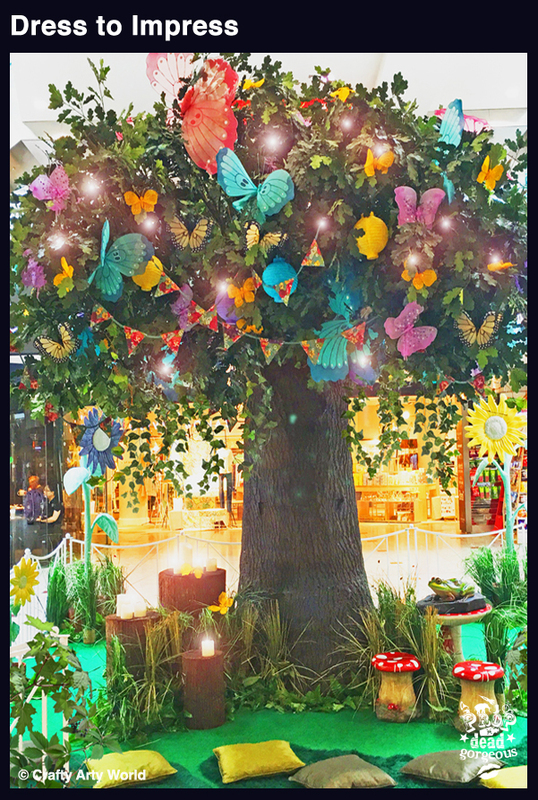 Standing over 5m metres high and styled with beautiful faux butterflies, bugs and bees, LED lanterns and hand painted bunting, the installation stopped shoppers in their tracks! Set over four days, over fifty events were designed to appeal to gardening experts and green fingered novices alike, amongst Canary Wharf’s twenty acre outdoor space as well as in the fabulous shopping malls. The family friendly festival was perfect to introduce children to the creative and fun side of plants with plenty of activities to sow the gardening seed early on. Prop Dead Gorgeous’ interactive talking tree proved a highlight as youngsters were able to watch, listen and learn a myriad of green fingered stories delivered by mystical tree fairies and their garden friends. With the Queen’s official Birthday today, and then between May 12-15 the Queen’s 90th Birthday Celebration Pageant in the private grounds of Windsor Castle, you too can bring a bit of pomp, pageantry and spectacle to your own event – whether it’s an office party, corporate family fun day or discerning private party! 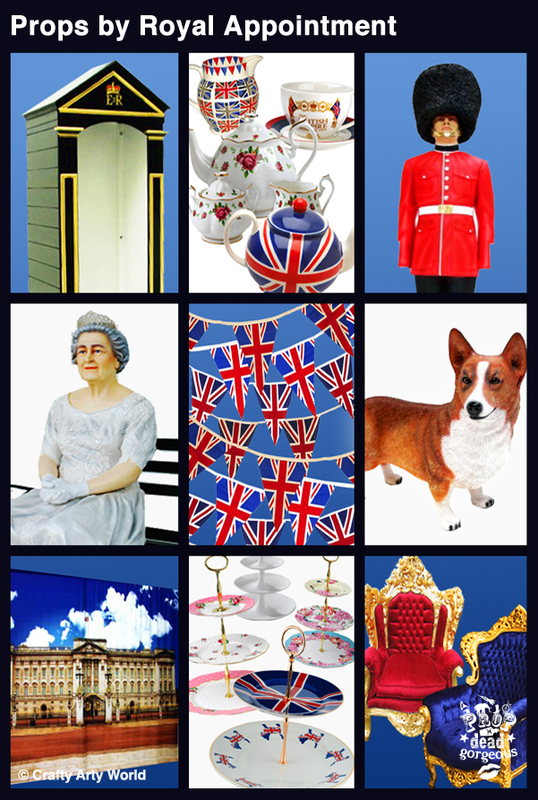 By creating a ‘Right Royal’ theme of course, and that means setting the scene with some great props, dressing and even costumes! At Prop Dead Gorgeous we are lucky enough to have worked within ‘royal circles’ so we know whats ‘in’ and ‘what’s out’ and one thing is for sure… dressing up and ‘selfies’ are ‘in’ for sure! Why not hire our life size Guard models, complete with Centry Post and Backdrop of Buckingham Palace complete with model Corgis, Throne and even Her Majesty herself. Then get your selfie stick out and you’re away! Vintage Tea Dances are all the rage too and we have Bandstands, Bunting, Flags, Flowers, Floral Arbours, Picket Fencing, Gramophone Players, Crockery, Furniture and so much more besides. With Spring just around the corner, Prop Dead Gorgeous has a fantastic new theme – The Farmers Market Experience! 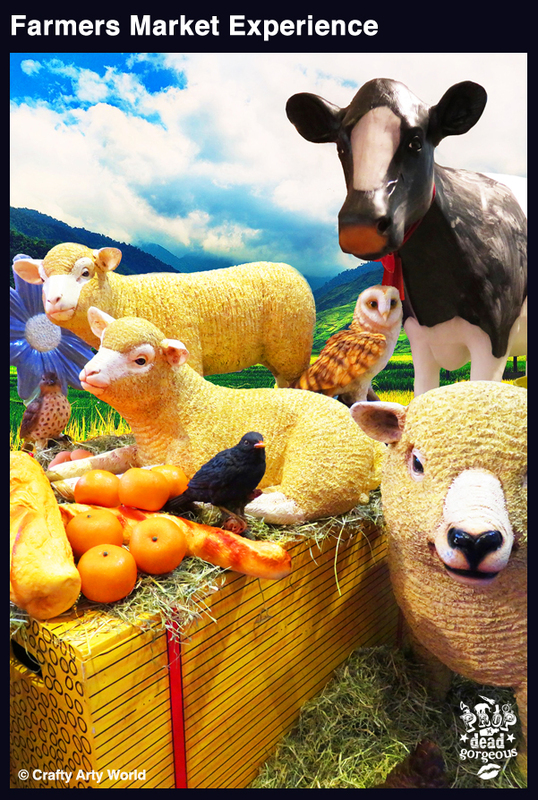 We have a huge selection of props including life size animals, farm buildings, carts, troughs, barrels and wooden fencing along with artificial foliage ranging from wheat sheafs and hedging to giant Oak trees. Then to set the scene, lets not forget the endless bunting and blankets! There’s themed entertainment and activities guaranteed to pop a smile on your face too! How about learning how to milk our full size animated Jersey Cow (well you never know when you might need it), as well as colourful canopied market stalls where you can acquire skills in butter churning, and attend workshops run by our foodie experts in preserves, jams and chutney making! 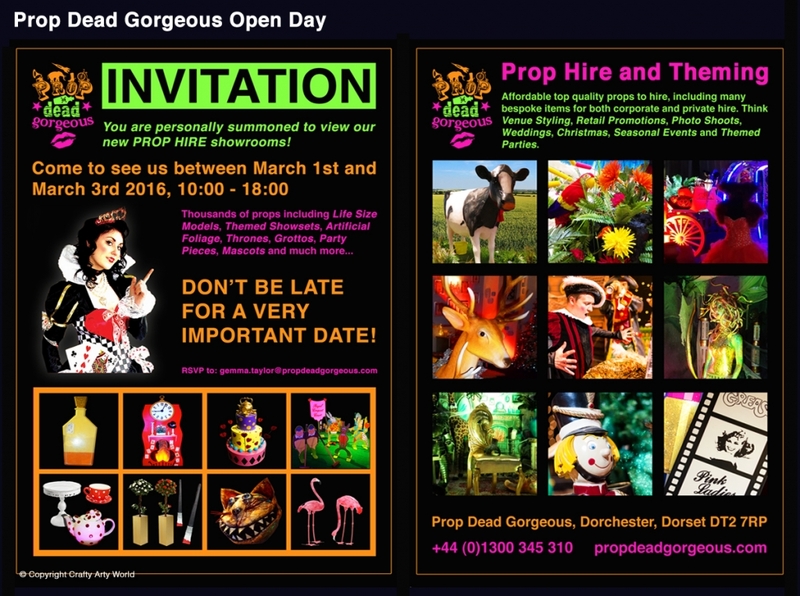 Prop Dead Gorgeous is opening its doors for a Spring Open Day! VIP guests, both corporate and private clients, are invited to view the showrooms between March 1st to March 3rd inclusive. Visitors will be able to see things first hand, chat to the PDG team, and interact with the many props. They will be able to discuss how to improve their forthcoming events with theming tips, and creative ideas that won’t break the bank! The props and themed installations on display will include: a full Alice Through the Looking Glass show set, a giant Under the Sea adventure complete with life size great White Shark, Hall of Whacky Mirrors and stunning Garden Games including themed Crazy Golf and giant interactive Story Books. Seasonal displays are not forgotten either – look out for our cute Ice Cream Pop Up Grotto, a Christmas Bridge and a Polar Bear Playground! 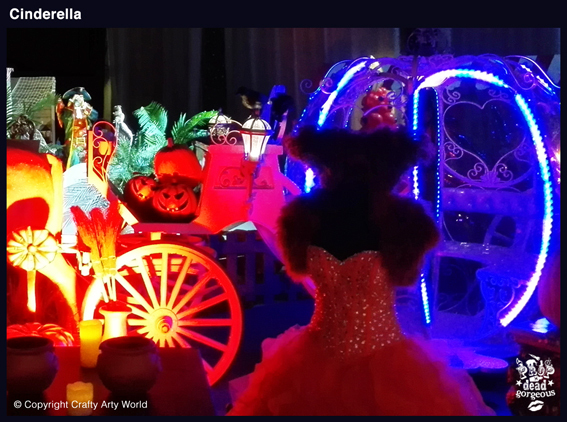 Disney’s iconic fairytale Cinderella is loved by millions of children thoughout the world and Prop Dead Gorgeous was delighted to provide the props, sets and dressings for a spectacular fairytale themed corporate event in London during December. Attention to detail was paramount and the bespoke installation included Cinderalla’s transformation from kitchen maid, set in the castle kitchen complete with scullery, pots and pans, and a Royal Princess riding in an LED twinkling royal carriage led by life size pink horses. To find out more what Prop Dead Gorgeous can do for your event, whether private or corporate, why not visit our themed showrooms for inspirational ideas. You can contact Gemma Taylor at gemma.taylor@propdeadgorgeous.com to set the date! In millions of homes around the world from Buckingham Palace to the White House, the Christmas Tree is a tradition that owes its popularity in part to Queen Victoria, as whatever she did at court became immediately fashionable! In fact, when the monarch and her German Prince, Albert, were sketched in the illustrated London News standing with their children around a beautifully decorated Christmas tree, the trend was well and truly born. 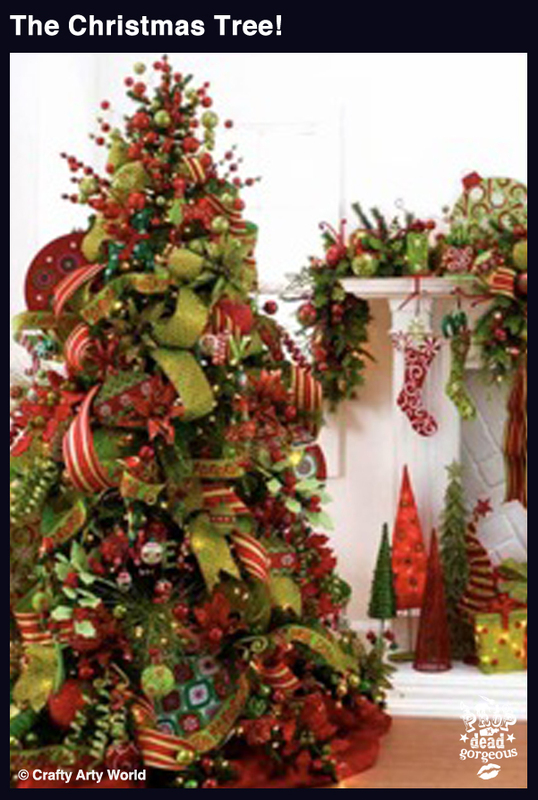 At Prop Dead Gorgeous, we have a huge selection of faux Christmas trees of the highest quality in an array of colours, shapes, sizes and finishes, along with a wonderful selection of embellishments from around the world. And they certainly don’t come more exciting this Halloween, as Prop Dead Gorgeous recreates a fabulous themed show set from the iconic 1960’s American TV show The Addams Family for a shopping centre’s Halloween promotional event. Take one giant lion, a giraffe in suit, a curious fish tank, a Medieval suit of armour, sweeping stair case, family portrait, vases of feathers and a house on ‘Cemetery Lane’ and you’re getting the picture, right? For more details on this great campaign and to see live images from the event as they happen, visit us @propdeadgorg or @craftyarty or enjoy them on facebook between October 26th to October 31st inclusive. The festive season may be in full swing (well behind the scenes anyway!) but I am delighted to say that at Prop Dead Gorgeous it’s not all about tinsel, trees and topiary. This last year has seen some unusual commissions come in for film, retail and private hire. Bespoke props are what we do best! If you can’t find the right prop you are looking for from our vast catalogue, we can make it for you. With full time in-house illustrators, graphic designers, scenic painters, sculptors, animators and theatrical carpenters and costumiers, Prop Dead Gorgeous will bring your vision to life in exciting ways. With over 40,000 square feet of workshops and warehouses, we can cater for set prop and model builds of any scale. 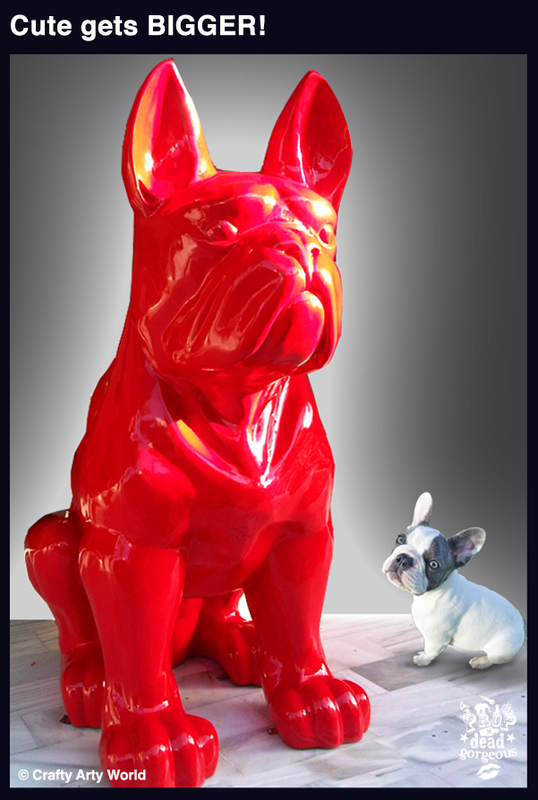 We particularly loved the ‘giant canines’ installations, standing over 3m high, as shown by the real life famous little French bulldog pup, ‘Sailor’. We obviously have a thing about dogs, as next on the list is Snoopy’s Dog House, ready for The Peanuts Movie which is out on 21st December. Halloween is just 73 days away. Is that freaky or not! With Summer all but a distant memory and Christmas in the bag, we are turning our attention to one of our favourite times of the year; Halloween. 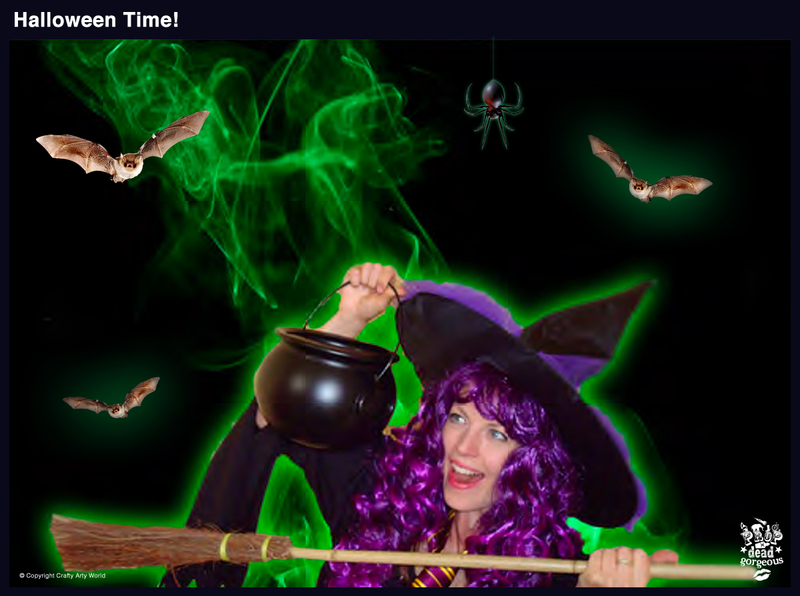 As most of you know, here at Prop Dead Gorgeous, we don’t need any excuse to party, no matter what time of the year. In fact, our set builders are ‘dying’ (excuse the phrasing but we are talking Halloween here!) to let rip (not r.i.p. naturally) their latest spooky sets. So what do we have that really STANDS OUT from the crowd? 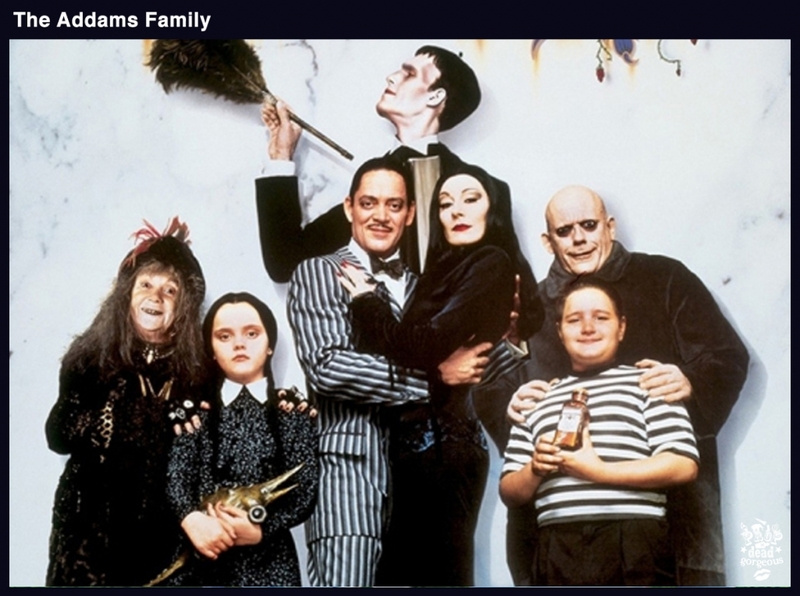 Well, we have the BEST Addams family set you have ever seen, a giant animatronic Dragon that breathes faux fire, as well as a deep dark Bat Cave…… assuming you are brave enough to go inside and see all the special effects! Of course we have all the ‘essential’ bits in between too, such as endless Broomsticks, LED Cobwebs, Cauldrons, Rats, Spiders, Skeletons, Bones, Tombstones, Pumpkins, Lanterns, Wizards, Sorcerers, Ghosts and Ghouls to name just a few. We work with all budgets, any size. Props can be either dry hired or installed just for you at minimal cost. Better still, our events team over at Crafty Arty Parties can help you run any corporate event and Big Footfall®, our specialist retail division ( newly launched just ten months ago) is already the ‘must go to’ company for any family entertainment experiences for promotional retail and brand solutions…. ‘Need it, Want it, Win it’ was the tagline used by a major UK shopping centre, where customers could be in with the chance of winning an amazing tropical holiday. Once registered, and with receipt of a ‘boarding card’, visitors were able to play an in-centre game to win the holiday, and other amazing prizes provided by a selection of tenants. 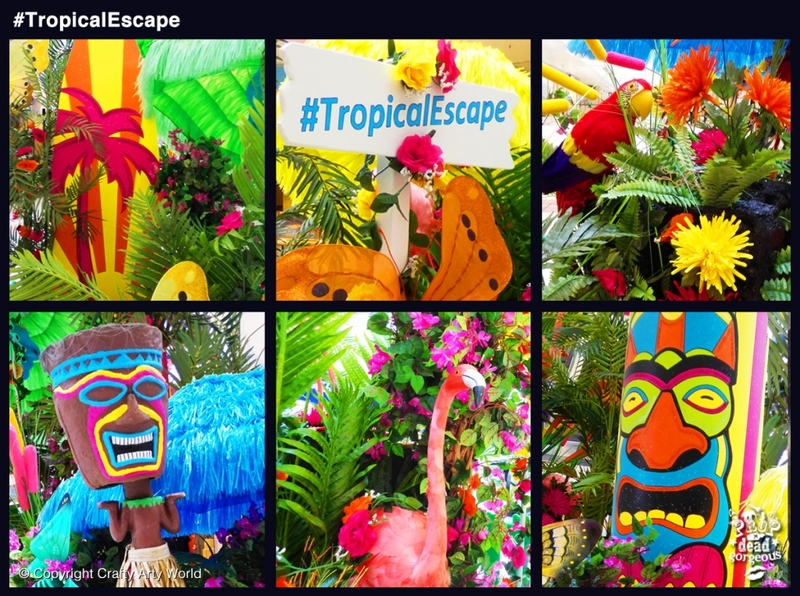 To make them feel they were on holiday even before they went, Prop Dead Gorgeous theming team got to work and transformed the higher and lower malls into a pacific paradise! Using bright and colourful ‘on trend’ colours, the installations were created exclusively for this Summer campaign, and included giant Tiki Heads, Totem Poles and hand painted Surf Boards along with Raffia Parasols, life size Parrots, exotic Birds and a fabulous collections of tropical Flowers and Grasses. As the country basks in glorious sunshine, and family fun days, festivals, open air concerts, ‘parties in the park’ and goodness knows what else is in full swing, here at Prop Dead Gorgeous it’s still not too late to ‘holiday up’ your event with some great Summertime props. With record temperatures set to continue across the isles, a Seaside or Beach theme are still some of our most popular experiences, and you don’t even have to leave your office to feel the sand, (or pebbles) between your toes! From the shores of windy ‘Waikiki Beach’ (yes we even have our own wind machine) and sophisticated ‘Sandy Lane’ in Barbados, to a good old British ‘Party on the Pier,’ or ‘Beach Bum was Here,’ at Prop Dead Gorgeous we definitely have ALL areas covered! 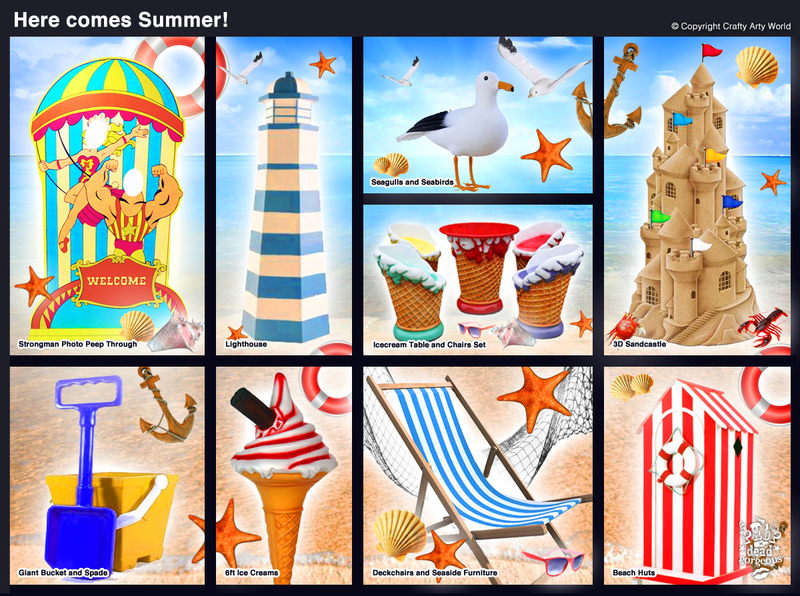 Take a British Seaside theme for example. We have everything from Giant Deckchairs and Aunt Sallys. Or how about jumbo resin Sandcastles and real life Sand Pits (after all everyone’s a kid at heart aren’t they!) as well as shiny new Beach Huts with super size fake Ice Creams and matching Furniture! Cost and condition are important too, and all our props are brand new and extremely affordable. Bespoke prop service at no extra cost! Prop Hire Showrooms OPEN – get your Golden Ticket Experience! As seen on Channel 5 our Prop Dead Gorgeous Showrooms are open for business and to celebrate we are offering a unique and FREE Golden Ticket Experience! An exclusive ‘private viewing’ and grand tour of where the magic happens! Just a quick train journey from Waterloo away, you will enjoy an exclusive opportunity to see our 2015/2016 range of bespoke props and benefit from a special ‘Golden Ticket’ discount, giving your company substantial prop package reductions off our regular prop hire prices – these are only available on the day. If you are looking for AFFORDABLE props to hire, sensational styling or simply inspiration for your next event, redeem your Golden Ticket Experience now by emailing gemma.taylor@propdeadgorgeous.com today! Channel 5 – The Hotel Inspector! Earlier on this year, Channel 5 contacted Prop Dead Gorgeous to see if we would be interested in assisting with props and theming for TV! 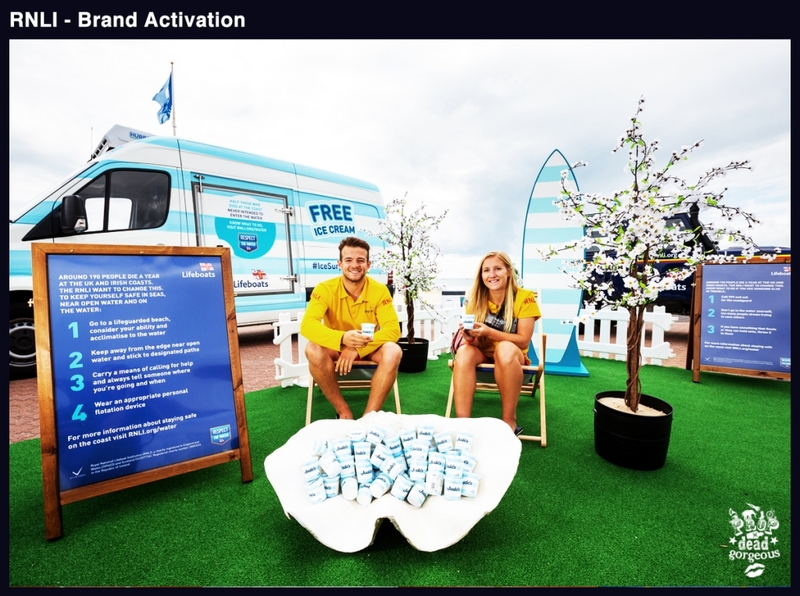 With Channel 5 producing such famous shows as Big Brother, Costa de Sol Casuelty, The Classic Car Show, Kids Hospital at Christmas, The Gadget Show, The Dog Rescuers and many more besides, we were of course delighted to help! Fast forward to next Thursday April 30th, when you can see our TV debut in the latest series of The Hotel Inspector and The Hotel Inspector Returns starring famous award winning hotelier, Alex Polizi. Alex is on a quest to salvage struggling hotels and turn the fortunes around of some of the UK’s worst establishments. We can’t say much about the themes and content until the show airs, but why not watch it for yourself on Channel 5 at 8pm. We can’t wait to see it ourselves, and are looking forward to the next one! 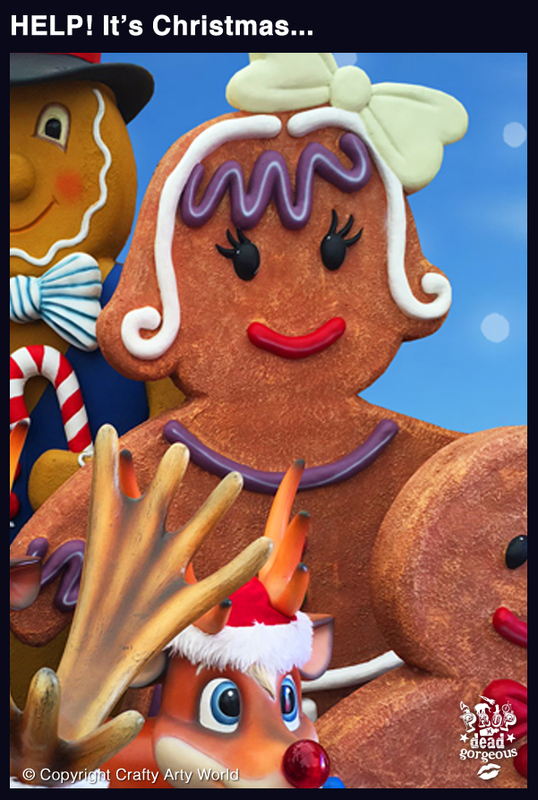 Props and theming fit for Royalty! With Prince William and the Duchess of Cambridge, Kate Middleton, expecting their second baby in April, the question on everybody’s mind is will it be a boy or a girl? 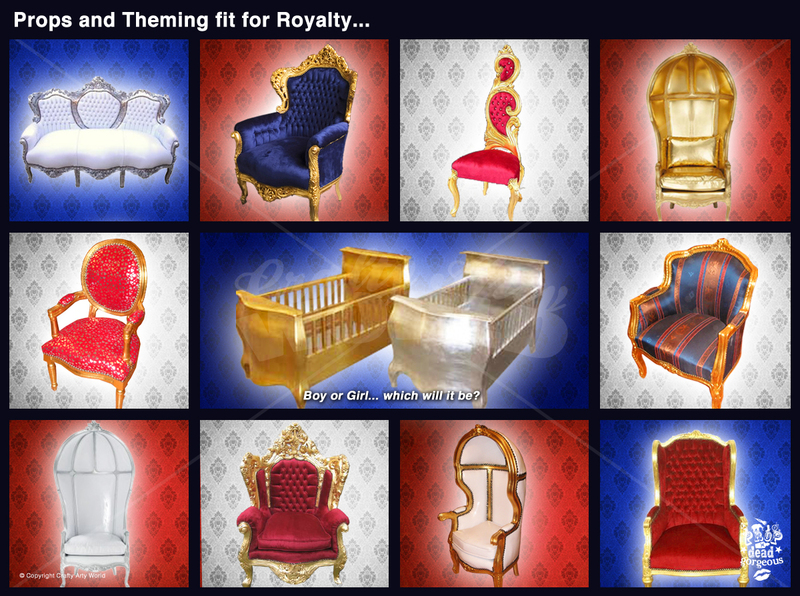 Here at Prop Dead Gorgeous® we are prepared for both eventualities, with ornate cribs and lavish thrones fit for Royalty! What’s more, we’ve got more British bunting and red roses than you can shake a stick at, so we can cover everything from opulent outdoor events to sumptuous soirees. Believe it or not, we don’t have all of this stored up ‘just in case’… With a little help from the team at Crafty Arty Parties, we really do produce parties for Royalty! So if you’d like to make sure that your party is fit for a Prince, contact gemma.taylor@propdeadgorgeous.com to discuss a peerless prop package!